Winter gardens take wing when they&#x27;re well supplied with what birds need. As the first snow flurries fly and the soil freezes into a popsicle, remember to stock up for your feathered friends. Hang a variety of birdfeeders and watch those bare branches blossom with visitors. 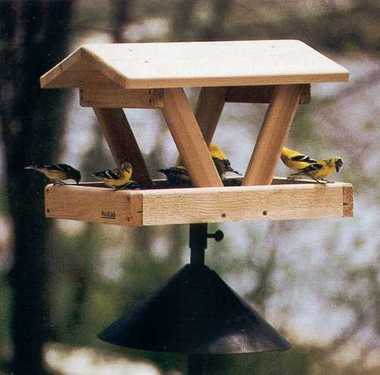 Most birds flock to feeders when they know food is available in a safe place. Nature's supply of bird food - berries, insects and flower seed - dwindles in late fall. (Crabapples are the dietary last resort for many birds.) When the leaves fall, it's time to beckon the birds with birdseed, suet and fruit. A variety of feeders prevents a one-species monopoly of jays, starlings or sparrows. You'll be most successful recruiting hungry birds if you start with a few classic feeders. Then, as you get to know the winter sojourners in your area, add on bells and whistles to attract more exotic species. Set out birdfeeders and poles in fall, with an eye for a safe spot in the yard. Situate poles where the sun shines in the morning (a bird's preferred dining time) and hang tree feeders on thinner tree branches inaccessible to thieving squirrels. Feeders hung at different heights will draw more varied birds. Base your feeding stations away from potential cat hide-outs in undergrowth and at least 10 ft. from windows, to avoid avian smashups. Festoon outdoor evergreen garlands with pieces of fruit and strings of cranberries or raisins and add on a birdseed wreath for good measure. Your faded Christmas tree can come back to life as a post-holiday birdfeeder studded with tasty treats including popcorn, nuts, fruit and suet. Yes! Part of the beauty of this feeding the birds is that anyone can handle it. Any well-stocked larder includes a large, sturdy sunflower feeder filled just with sunflower seed. The one-seed specialty prevents messy seed picking and dropping that occurs when larger birds peck through a mix in search of sunflowers. If you're in the mood for a little music, include a tubular feeder in your repertoire to attract songbirds such as finches, nuthatches and chickadees. Draw a greater variety of birds to tubular feeders by filling them with a birdseed "lasagna" (layers of different seeds). Goldfinches also flock to a feeder stocked with thistle seed. This oil-rich birdseed is harvested from a sunflower relative known as niger. Suet (beef fat) supplies the soft-food eaters of the bird world with cold-weather fuel. Woodpeckers and other birds dive into the suet feeder from fall through early spring . Open feeding platforms entice a wider diversity of birds that can't get a grip on rod-type perches. Offer seedy spreads here to bigger birds. In winter, put out fruit (halved oranges, raisins, cranberries, currants and apple slices) in bowl feeders. They also come in handy for dishing up mealworms for bluebirds and crumbs or suet. Soak dried fruit in water first to soften it. As the ground freezes and heavier snowfalls occur, birds work harder to melt snow for drinking and preening (necessary to insulate their feathers). Keep your birdbath thawed and ready with a special bird bath heater. If an extension cord is needed to supply electrical juice, use a heavy-duty utility cord. Once weekly in winter, check seed levels in all feeders, add fresh water to bird baths, and brush off seed trays and tables to prevent spread of bird viruses. Keep out greedy squirrels with a squirrel guard or bafflers mounted on your feeder pole . Squirrels can be sidetracked if you provide a feeder box just for them.